Zentimo has a well thought-out user interface which allows most users to comfortably work with the program immediatelly after its installation, without any additional actions. However everyone is unique and has his own choice and work style. Therefore, Zentimo allows to change virtually every aspect of the program. 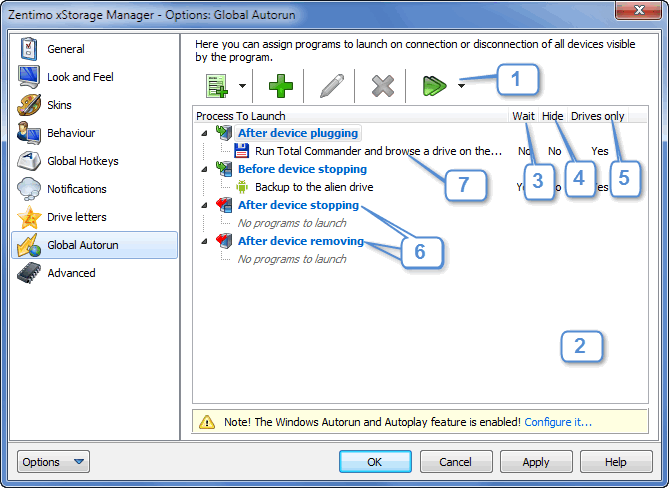 To change the program options call the Options dialog via the device stop menu or the main window ( button). Allows to power off devices on stopping. Allows the program to display ALL USB devices, even those that do not need to be stopped before device removal. When this option is enabled, the program shows only those devices which report to the system that they need to be stopped before disconnection. Why is this option needed? Some devices report to the Operating System that they can be removed without stopping the device before removal. However, a device may actually need to be stopped before removal, because some important data which was transmitted to (or from) the device may be lost. An example of such a device is a USB programmer. Some HID devices (mice, keyboards, trackballs) sometimes enter an incorrect state - they stop reacting to the user's actions. Physically disconnecting and reconnecting the device may help in this case. However, if the device is located in a hard-to-get-to place, it is a good idea to stop this device and then "Return device back" from the program. Finally, some people simply feel more confident if they can see and control all USB devices connected to the computer. For some devices, those devices cannot be seen either in Zentimo or the native Windows safe removal tool. Enable this option and you will see all storage devices, even non hot-swappable items (such as your IDE drives). You can then hide any devices which do not need to be displayed from the stop menu and leave only the required ones. The program speaks about 40 languages. If you cannot find your native language in the list, or you think the program has bad wording, feel free to notify us. Manages exterior of the program. 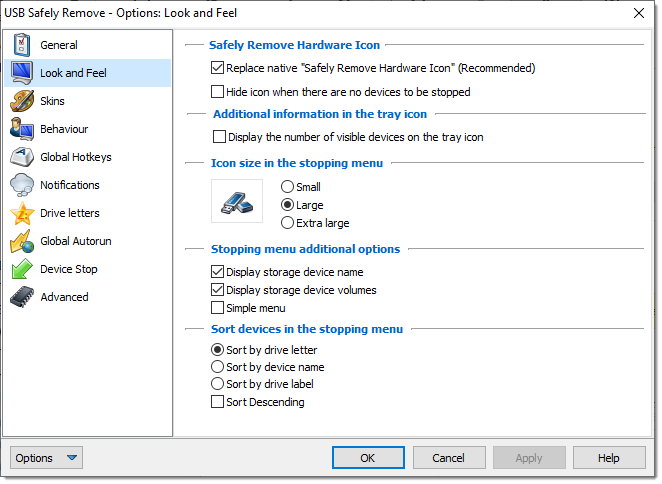 Allows to display native "Safely Remove Hardware" icon in the system tray. By default the program hides this icon. Lets you hide the program icon, when there are no devices in the menu to be stopped. You can choose which size of device icons you want to see in the stopping menu: Small, Large or Extra large. Allows the program to display the number of visible devices on the device menu in the system tray icon. Use this option to display or hide names of storage devices. Storage device volumes can be displayed in the stopping menu or can be hidden from it using this option. Check this option to make the program stopping menu simlier. Allows you to sort devices in the stopping menu by drive letter, device name and drive label. "Default" - is a default skin, which is built into the program body. "Classic" - a skin simulated Windows Classic Scheme. "Black Contrast" - a black contrast skin, which is helpful for low-seeing people. "Black Velvet" - is an additional black skin with soft shades of color. "Win8ModernUI" - Windows 8 Modern UI style skin. Set by default on Windows 8. You can find out how to use predefined skins or make your own skin here: How to use skins? Manages the program behaviour - program reaction on user's actions. 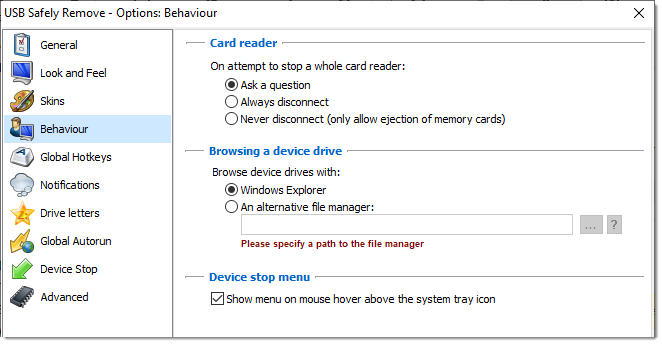 What to do if a user tries to stop a card reader instead of a memory card? How do I select the desired File Browser? When you choose the "Browse Drive" item in the context menu for that device, or press the Ctrl-B key combination for that device, Windows Explorer is used as the default browser. If you prefer to use an alternative file manager, select the "An alternative manager" option and enter the required command-line argument for the file manager in the field below. Use %drive% as the value for the selected drive. 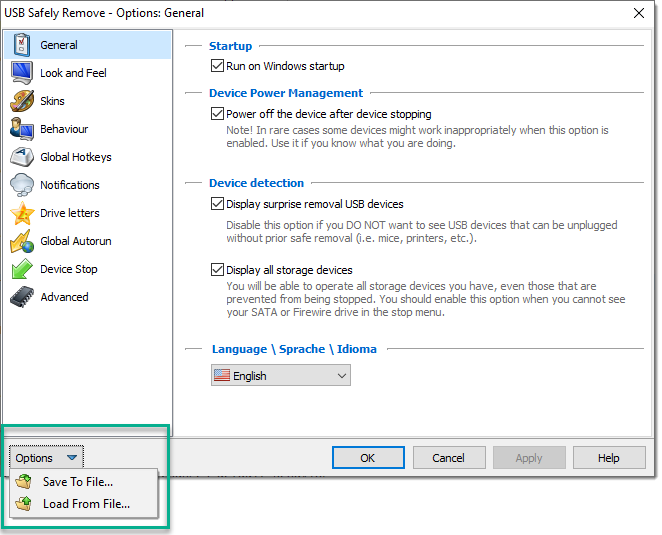 The program will replace %drive% with the drive letter of the selected device. allows you to browse the selected drive letter in a newly launched copy of Total Commander. For your convenience we have implemented an integration with Total Commander, one of the most popular file managers. Just choose an item in the menu which is launched by pressing "?" button, and the program will generate a required parameter combination by itself to open a drive on the right or left panel of a running Total Commander. The only thing you must do is to specify a path to Total Commander executable. Manages the behaviour of balloon tooltips, checking for updates, proxy settings. 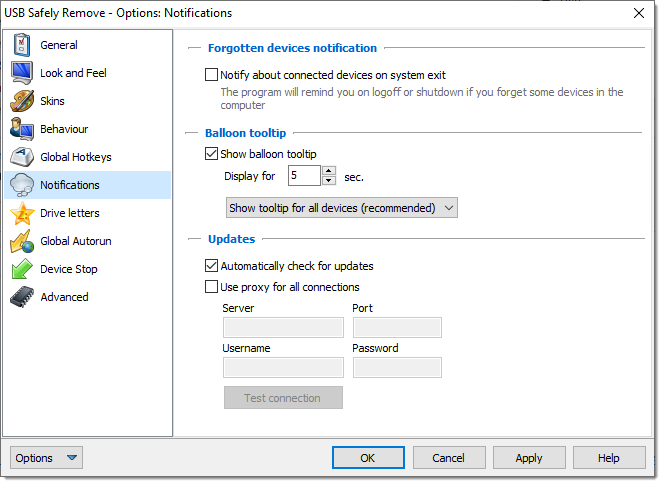 "Baloon tooltips" are program notifications about events such as: device connecting, device stopping, disconnecting or assigning the device another drive letter, and so on. The "Show balloon tooltip" check box enables or disables whether or not toolstips near the icon in the system tray are displayed. If the check box below is enabled, you can also specify a time interval for displaying tooltips on the screen. As well, you can specify which device types display tooltips - such as only for those items displayed in the stop menu, or for all devices (both displayed and hidden). Every 5 days the program checks with the "zentimo.com" webserver to see if a newer version has been released. If so, the program will notify you that an update is available. Note: When checking for updates, the program only connects to this host and port! If you notice the program trying to connect to any other host or port, it may be infected with a virus. If suspicious activity is present, please check all files in the program with your antivirus software. You should enable these settings only if you are connected to the Internet via a proxy server. These settings will be used by the "check for updates" and the error reporting mechanisms. You should set up this settings only if you are connected to the Internet via proxy server. These settings will be used by the "check for updates" and the error reporting mechanisms. Enable this check box if you are running under a proxy server. If you are not familiar with the configuration requirements for your proxy server, check with your network administrator for the proper parameters. As an example, the following are a set of standard parameters for a proxy server connection. If your web browser already works properly with your proxy server, you can copy the settings from your browser's network settings option dialog box to this dialog box. Once the changes to the settings are complete and ready to be saved, you can use the "test connection" button to check if the proxy settings are correct. If the connection to the zentimo.com server with the specified proxy settings does not work properly, you will be informed of the error. Manages drive letters of hot-plug devices. If an option was enabled and you are disabling it, the program returns to the system all "empty" drives. You can use it, for example, to temporarily return all drives into the system. Once you close the program it does not return drives of empty slots into the system. So if you insert a memory card into the slot that was empty (and its drive was hidden by the program), while the program is not working, the inserted memory card will be unavailabe in the system! Just run the program and it makes the memory card available in the system. Prevents assigning specified drive letters to hot-plug devices All letters you have specified in this field will not be assigned to hot-plug devices. It is useful if you want to reserve this letters for network drives. The "Fixed drive letter list" shows what drive letter have been fixed and what device and volume owns it. 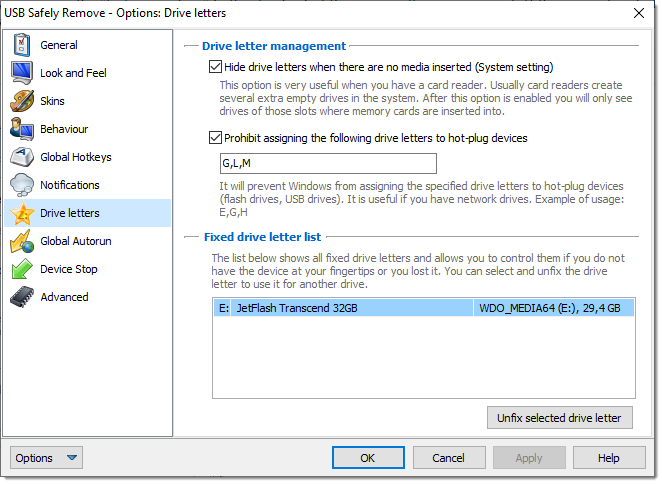 In order to unfix any drive letter just select it in the list and click "Unfix selected drive letter". Enables you to launch programs on events with devices: before\after stopping, on connecting, or after removal. Unlike Local Autorun, this allows you to launch programs not only for a certain device, but for all hot-plug devices on the system. Read more about setting it up here: How to use program autorun? If the program becomes unstable on your computer, or does not display the required devices, or you just displayed an error notification, we would appreciate it if you enable this option and then work with the program in whatever way is required so the bug you have discovered shows up. Once you have the verbose log of the problem, then send us a bug-report from the "Report a bug" option on the Main Menu. Read more at topic: How to send a note or a feature request. After you have sent us a report, we recommend disabling the verbose logging option. While this option makes the program write lots of useful bugfix information in the log you send to us, the log grows very quickly with verbose logging enabled.